Traveling around Lake Michigan for vacation is one of my dream vacations. There are many places to visit in the four states that touch Lake Michigan. My Lake Michigan vacation starts in the suburbs of Chicago and goes north into Wisconsin, to the upper pennisula of Michigan over the Mackinaw Bridge, and south through Michigan, through Indiana, and back into Illinois. There are many places to play, shop, and visit along the way. As you travel around Lake Michigan, you will have the opportunity to put your toe into four of the great lakes: Lake Michigan, Lake Superior, Lake Huron, and Lake Erie. Chicago has a lot of great places to visit, from its museums, sports teams, Michigan Avenue, Buckingham Fountain, and its great beaches. The five major museums are the Museum of Science and Industry, the Adler Planetarium, the John G. Shedd Acquarium, the Field Museum, and the Art Institute. A visit to the Millenium Park is great for the kids, and don't forget the sky observatory at the top of the Willis Tower, formerly the Sears Tower, or the Hancock Building. Local Chicago Zoos are great for the kids and Local Chicago Gardens are favorites among adults. Shopping is a pleanty along Michigan Avenue's Magnificent Mile or along State Street. Looking to stay in Chicago for a couple of days, search for Hotels in Chicago and compare over 30 sites. As you travel up I-294 to I-94 towards Milwaukee, Wisconsin, the place to stop is Gurnee, Illinois. Gurnee has the best amusement park in Illinois called Six Flags Great America, also in Gurnee is the Gurnee outlet mall which is a great place to shop. Before you get to Milwaukee and just over the border in Pleasant Prairie, Wisconsin is a Jelly Belly warehouse where they give warehouse tours and have a Jelly Belly store. About 90 miles from Chicago is Milwaukee, Wisconsin. If you are in Milwaukee at the end of July, you will need to catch Summer Fest which has a lot of food and music. Also in Milwaukee is the Miller Coors Brewery which offers great tours Monday thru Saturday. Looking to stay in Milwaukee for a couple of days, search for Hotels in Milwaukee and compare over 30 sites. If you like golf, Whistling Straits, host of the 2010 US Open, is one of the best public golf courses in the United States and is located just north of Milwaukee in Sheboygan, Wisconsin. Just north of Madison, the capitol of Wisconsin, is the Wisconsin Dells. Famous for its water parks, gocart tracks, and the Ducks. A great place to stop and enjoy the day. Looking to stay in the Wisconsin Dells for a couple of days, search for Hotels in Wisconsin Dells and compare over 30 sites. On your way to Door County, is Green Bay, Wisonsin. Any trip near Green Bay must include a stop to Lambeau Field. Stop take a picture, and keep on going up the pennisula to Door County. There are some great beaches and if you are truly adventuresome, past Washington Island is Rock Island state park which takes two ferries to get to. A great place to spend the night camping. While in Door County, put your toe in Lake Michigan. You'll also find some great Bed and Breakfasts and Golf Courses. Our next stop on our vacation trip around Lake Michigan is Mackinac Island. On your way there, as you travel through the Upper Pennisula of Michigan, dip your toe into Lake Superior. As your cross the Mackinaw Bridge, you can find a beach on Lake Huron and swim in your third great lake. Mackinac Island is the end of the great Race to Mackinac sponsored by the Chicago Yacht Club. So if you are near here around the middle of July, come watch the boats come into the island. Looking to stay on Mackinac Island for a couple of days, search for Hotels near Mackinac Island and compare over 30 sites. As you travel down from upper Michigan, all along Lake Michigan are state parks and beaches with some of the greatest beaches and sand dunes you will ever see. In order to dip your toe into the fourth great lake, Lake Erie, you must go to the southeast side of Michigan just south of Detroit. If you take this trip, the Henry Ford Museum is a must see. If you hug Lake Michigan all the way to Indiana, there are a couple a stops for the kids, Michigan's Adventure near Muskegon and if you are into World War II ships, also in Muskegon is the USS Silversides near the Great Lakes Naval Museum. If you like beaches that are not widely traveled, then in Fennville, Michigan, there is a public beach at West Side Park that is a must stop. This beach is mainly pebbles along the shoreline, with a nice sandy area to sit on and a sandbar about 50 yards out in the water. Farther down is Holland, Michigan which has a tulip festival every year, Benton Harbor, and my favorite beach in Michigan, the Warren Dunes. Everytime I visit a beach on Lake Michigan, I realize how soft the sand is. I've been on beaches in Hawaii, California, and Florida, and I still think the Michigan beaches are the best. We recently visited Grand Haven and I was impressed by the massive beach which is a combination of the Grand Haven City Beach and the Grand Haven State Park Beach. On this recent visit, we also had a chance to see the Musical Fountain, which is a light, music, and water show. The show is in downtown Grand Haven and starts around 9:50pm and last for about 20 minutes. There are a lot of great places to stop between Chicago and Orlando is you don't go in a straight line. Another great vacation which takes you from Niagara Falls to Washington DC and back to Chicago. Lots of great shows for adults and activities for the kids. In Bloomington, Minnesota, a suburb of Minneapolis, sits the Mall of America. This is unlike any other mall you have seen as it includes an indoor amusement park, an acquarium with a great shark tank, and much, much more. We visited Chicago not too long ago, but it was far too cold to spend time near the lakes! Sounds like we'll have to go back and remedy that. The trip you describe is one on my bucket list of travels. I want to go when the tulips are blooming. Can you believe I grew up in Illinois and never made it to Chicago, except the train station and airport? Thanks for this nice article. We've enjoyed camping at Sleeping Bear Dunes State Park in Michigan. We also loved our stay on Mackinac Island a few years ago (fudge and bikes....). 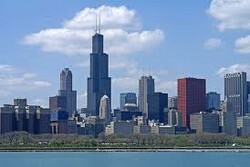 Chicago is also a wonderful place to visit, especially along the lakeshore. We were there just recently. Your article has given me ideas of more places to visit! Before Walt Disney World and Seaworld there was Marineland. Learn the history of the park and why even after 75 years Marineland is a must-see attraction.